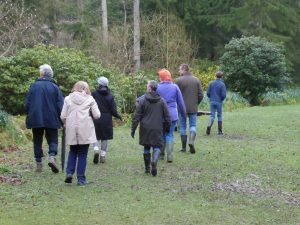 A select few of us ventured out to Evenley Wood Garden in intermittent drizzle in April. Despite the weather, it was an enjoyable outing with blue drifts of Scylla, yellow daffodils, red Camellias in full flower and white/pink wild cherry blossom to cheer us up along the way. The Red Lion pub in Evenley warmed us up afterwards and provided a filling lunch.